You should take a fiber supplement daily to improve and maintain your digestive tract health. The most beneficial fiber supplements are based on soluble and insoluble types of fiber. These don't only promote regular bowel movements but are beneficial for your overall health. For example, Inulin-based fiber supplement that is a key ingredient in Skinny Piggies gummies act as a prebiotic. This means that it improves gut health by fermenting and feeding the healthy intestinal microflora. Inulin also keeps your blood levels under control and promotes heart health. Make sure that you're taking a supplement with a healthy dose of soluble fiber since this will keep your digestive system in check. Fed up with bland meals and boring diets? Feelings of restriction? You aren't alone. Let's be clear, lots of people don't like dieting. It's certainly not fun cutting out foods you enjoy, not fun being hungry, and most definitely not fun trying to exercise when you'd rather just chill on the sofa with a new TV episode of Desperate Housewives. The good news is, there's now a product that can change that: Skinny Piggies. What is this? First, let's take a look at what weight loss is. In order to lose fat, it is important that you take in fewer calories than you each day. When your body is missing food-based fuel, it begins to use the fat for energy, which results in losing unwanted weight for you. In order to achieve such caloric deficiency, you have to either boost your energy output through added physical activity or cut down your intake. To obtain desired results, you may really want to do both. Skinny Piggies help you eat a lot less and reduce your caloric intake and that makes achieving effective weight loss easier. Add in an additional daily physical exercise to aid accelerate the weight loss process. If only fat loss were this easy. Although cutting back on your calories may seem simple in theory, in practice your sugar cravings are more likely to keep you pining for sweets the whole day. No more sugar binges! 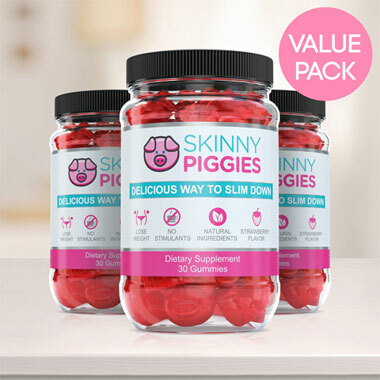 Skinny Piggies are tasty gummy fiber supplements that naturally help suppress your appetite, meaning that your cravings will be soothed without you cheating on your weight loss plan. Hunger is primarily driven by: caloric intake and the stretch in the stomach. When you eat, your stomach fills up and your stomach stretches. This makes you feel satisfied and stops you from eating more. 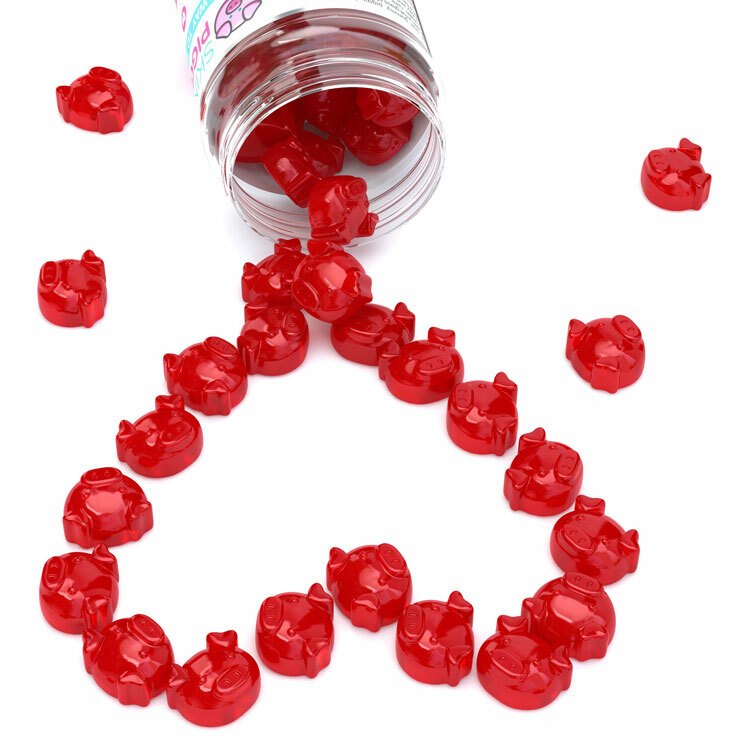 When you add Skinny Piggy gummies to your diet, you trick your stomach into feeling fuller, faster. Chewing a Skinny Piggy with a large glass of water about 30 minutes before eating dinner will cause it to form a soft gel in your stomach and gives you the sense of having eaten a big meal. That means you can combat desire for food and keep your caloric intake down, all without being hungry most of the time. The soft gel also enables the stomach to empty slower makeing you feel satisfied for a longer time. The sooner you feel full, the less likely you will continue eating which lets you to reach a lower caloric intake. As the gel surrounds the food you ate, it delays the absorption of carbs which flattens the level of glucose in your blood. By minimizing spikes in the blood glucose level you prevent those unbearable sugar cravings too. Avoiding blood glucose spikes in your daily life helps prevent food calories from getting stored as fat. 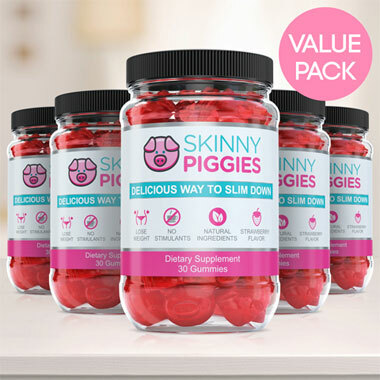 By keeping your body in weight-loss mode, Skinny Piggies gummy fiber supplements help your body lose weight. 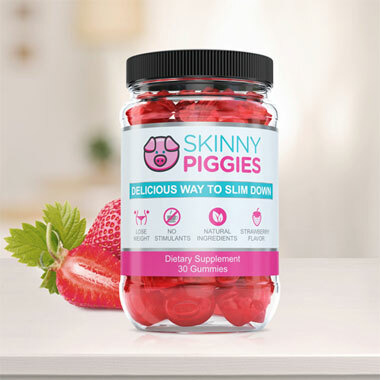 So you might be questioning, what is so different about Skinny Piggies gummies compared to some of the other diet pills you see online? First thing, our product contains zero artificial additives. Take a look at any fat burner and you'll see a whole line-up of chemical names. Genuine Ingredients: Unlike most weight-loss products, it's actually easy to pronounce every active ingredient in our gummies, ensuring that you're eating only the best quality ingredients. No Chemicals or Stimulants: Using a weight loss supplement without caffeine means that there aren't restrictions on when you may take them, and the formula without irritants means that Skinny Piggies are easy on stomachs. Great Flavor: Few weight loss supplements actually taste great, and none of them have the same great tasting flavor of strawberries, meaning that Skinny Piggies gummies are a pre-meal snack you will look forward to. Balanced Nutrients: Not only will Skinny Piggies help you slim down, they also support the healthy hair and nails and keep your skin glowing. You will love eating them so remembering to take your diet supplement will definitely no longer be an issue. They're tasty and anybody can begin right now. Try just one Piggie and they will certainly become a highlight of your day.